.NET Micro Framework is an open-source platform that expands the power and versatility of .NET to the world of small embedded applications. Desktop programmers can harness their existing .NET knowledge base to bring complex embedded concepts to market on time (and under budget). Embedded Developers can tap into the massive productivity gains that have been seen on the Desktop. 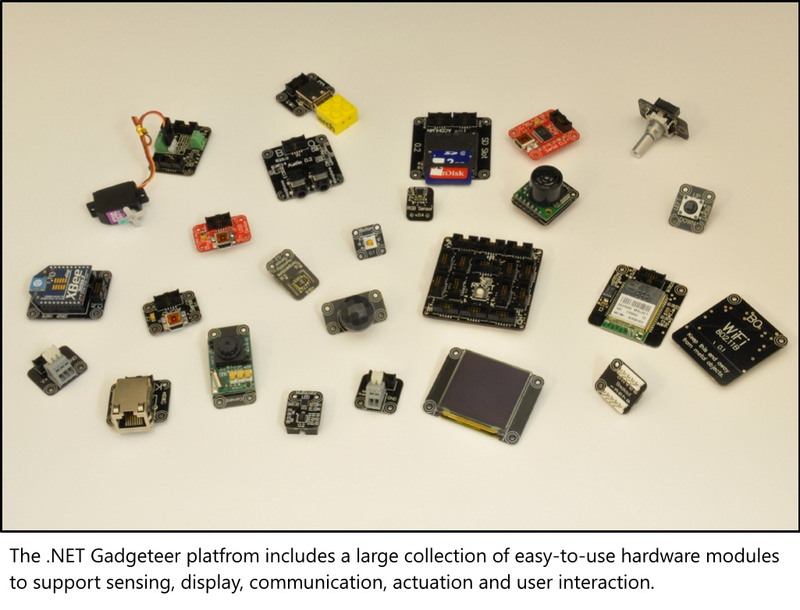 Microsoft has announced the official launch of Gadgeteer, a set of electronic parts designed to be plugged together to build prototypes or working electronic devices. Remote controlled cars and cameras are given as possible examples. Microsoft .NET Gadgeteer is a rapid prototyping platform for small electronic gadgets and embedded hardware devices. It combines the advantages of object-oriented programming, solderless assembly of electronics using a kit of hardware modules, and quick physical enclosure fabrication using computer-aided design. The typical .NET Micro-Framework device has a 32-bit processor with or without a memory management unit (MMU) and could have as little as 64K of random-access memory (RAM). The .NET Micro Framework supports rich user experience and deep connectivity with other devices. "It started out as an internal tool at Microsoft Research Cambridge, but its appeal to people outside the lab quickly became evident. The open source release will make this powerful technology available to others, including the hobbyists, teachers, researchers, and developers who have given us such positive feedback to date." Individual .NET Gadgeteer modules can be easily connected together to construct both simple and sophisticated devices. Each module adds some extra capabilities, such as the ability to display images, playback sounds, take pictures, sense the environment, communicate with other devices or enable user interaction. Let's deal with this question directly. It is not unheard of for corporations to open source technology while they walk away from it. This is not the case with .NET Gadgeteer. Just as we continue to make investments in the underlying .NET Micro Framework platform, we are planning continued support and investment in .NET Gadgeteer. In fact, we plan to be very proactive in helping partners get their products to market in the shortest time possible. In addition, we are extending the netmf.com web site to support .NET Gadgeteer and to assist our partners in promoting their products to the user community. We plan to do what we can to develop an active ecosystem for .NET Gadgeteer where a number of companies are making compatible kits and modules for a variety of markets. For example, we are planning on having curriculum for a variety of education levels available on this site. This end user site will be at http://netmf.com/gadgeteer. If you are an end user interested in getting .NET Gadgeteer hardware or have questions about existing hardware, please visit our end-user website athttp://netmf.com/gadgeteer. If you have any questions about building hardware compatible with .NET Gadgeteer or about the Core libraries and templates provided on this website, please either use our discussion forums to ask any questions, or contact us directly at gadgeteer@microsoft.com. This powerful combination allows fully functional devices to be prototyped in a matter of hours rather than days or weeks. The platform is built on the .NET Micro Framework, which allows small devices to be programmed in the C# language and make use of Visual Studio’s programming and debugging tools. .NET Gadgeteer combines flexible hardware and powerful, .NET-based software to enable users to create a myriad of different smart “gadgets” within a few hours—sometimes even quicker. It has enormous potential in fields such as research, fostering the creation of fast prototype devices without the months of labor Hodges endured helping develop SenseCam. It could help teachers make educational instruction more interactive, encouraging a new generation of engineers. It even could help hobbyists create devices that exist only in their imaginations. Microsoft .NET Gadgeteer is an open-source toolkit for building small electronic devices using the .NET Micro Framework and Visual Studio/Visual C# Express. Gadgeteer combines the advantages of object-oriented programming, solderless assembly of electronics with a kit of peripherals, and support for quick form-factor construction using computer-aided design. This powerful combination allows embedded and handheld devices to be iteratively designed, built and programmed in a matter of hours rather than days or weeks. Here is a video description of the platform - http://channel9.msdn.com/Blogs/Clint/NET-Gadgeteer. TinyCLR Gadgeteer Forum – Run by GHI, this forum is dedicated to .NET Gadgeteer topics, and is very active, with a number of smart and friendly folks from the community pitching in to help newcomers get started. I'm grateful to the many folks who've patiently answered my questions there. Seeed Studio Forum – here you can find tech support for Speed products. Official .NET Gadgeteer Forums – Several members from the Microsoft Research team responsible for Gadgeteer post here, so this is a good place to get info straight from the source. Core Gadgeteer API documentation – when you need to know what an API is for, this is a good place to start. Gadgeteer Source on Codeplex – when documentation alone isn't enough, you can always check out the source code to see what's really happening under the covers. Skewworks – run by Thomas W. Holtquist, and supplies additional software useful in .NET MF and Gadgeteer projects, including UI libraries and operating environments that allow for running multiple applications without reflashing. Valentin Ivanov's Blog – BreakContinue – Valentin has actually built not one, not two, but THREE Gadgeteer modules. impressive stuff! Ian only has a couple of posts that are specific to Gadgeteer, but there's a ton of great info on .NET Micro Framework that will be helpful to folks ready to move to intermediate topics. 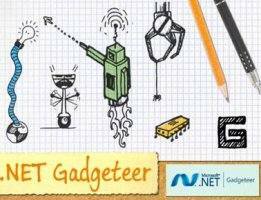 Microsoft .NET Gadgeteer is a rapid prototyping platform for small electronic gadgets and embedded hardware devices. Individual .NET Gadgeteer modules can be easily connected and programmed using C# to make fully functional devices. This video shows how easily .NET Gadgeteer modules can be connected together to build devices, including a simple MP3 player and digital camera. Combine the power of rapid hardware and software prototyping with innovative physical construction tools like 3D printers and laser cutters! .NET Gadgeteer devices are programmed in C# using the .NET Micro Framework. We can apply our knowledge of .NET programming on the desktop, Web or phone to embedded devices. Plus, we get wonderful Visual Studio features like Intellisense. 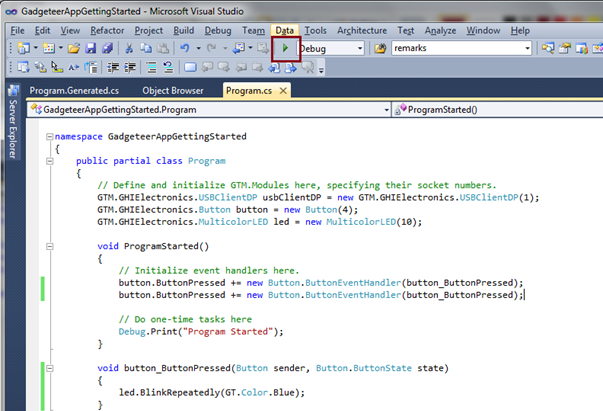 A variety of tools under development will make it easy to design enclosures for your .NET Gadgeteer project. Visual Studio and .NET can be used all the way from the cloud, server, web sites, laptops, etc. right down to small cheap devices! That is an amazing!